How Did Dan Armstrong's Evolve Between 1969 and 1971? 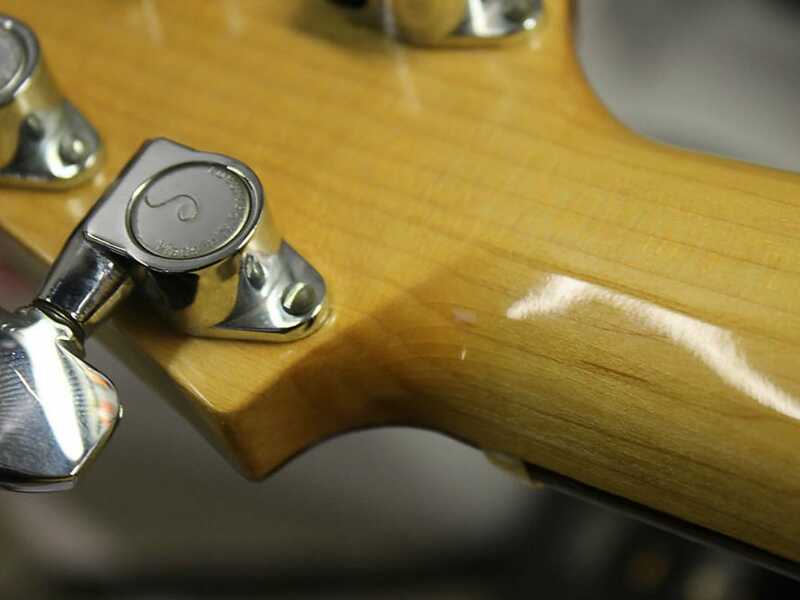 ​Although the basic instrument specification was largely unchanged during the '69 - '71 production run, there were some minor changes that are important to keep in mind when looking at a particular guitar or bass and wondering whether the parts are original. Felt Washers for the Strap Buttons. The very early guitars did not have the strap buttons cushioned with felt washers. For reference, A132D does not seem to have felt washers based on the pics we have, and A166D (pics shown at right) certainly does not have them. 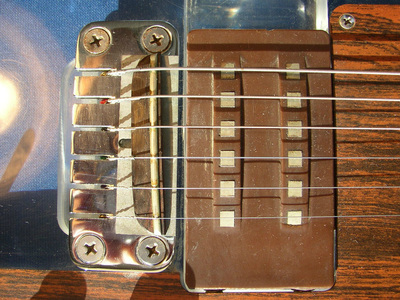 Felt washers seem to have been introduced after the first 75 guitars or so, and continued in use through the end of the run. 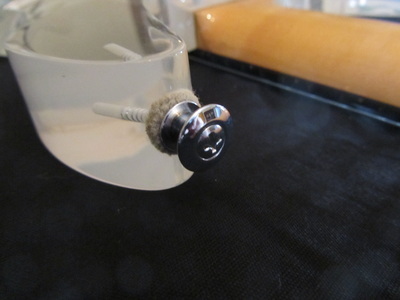 Both white and black felt washers were used at various times, although we think the white washers are less obtrusive and make a nice complement to the chrome strap buttons and clear Plexiglas. We think the felt washers served two purposes. First, the upper horn has a very tight radius that doesn't offer much seating area for the strap button. Adding a felt washer underneath spreads the compressive force and just makes for an easier visual transition. The felt washers might have also helped guard against over-tightening of the strap button screws. There was probably a fine line between properly seating the screw, and stressing the self-formed plexiglas threads beyond their limit. 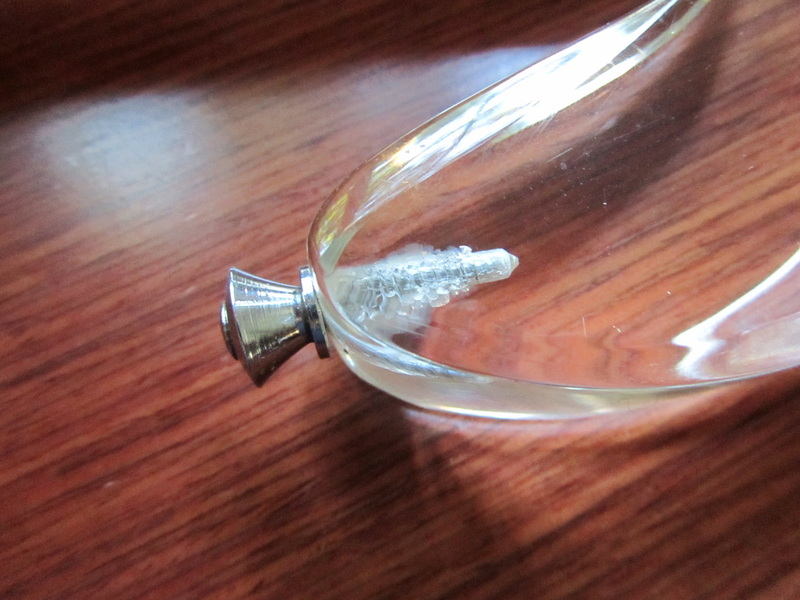 The thread damage with A166D - evident on all three strap buttons - shows what could occur. 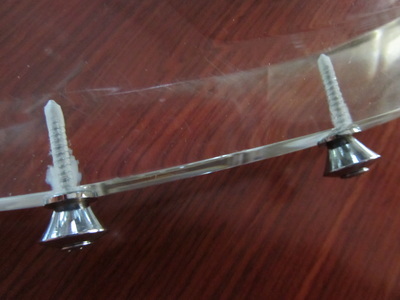 Bridge Plate Screws. 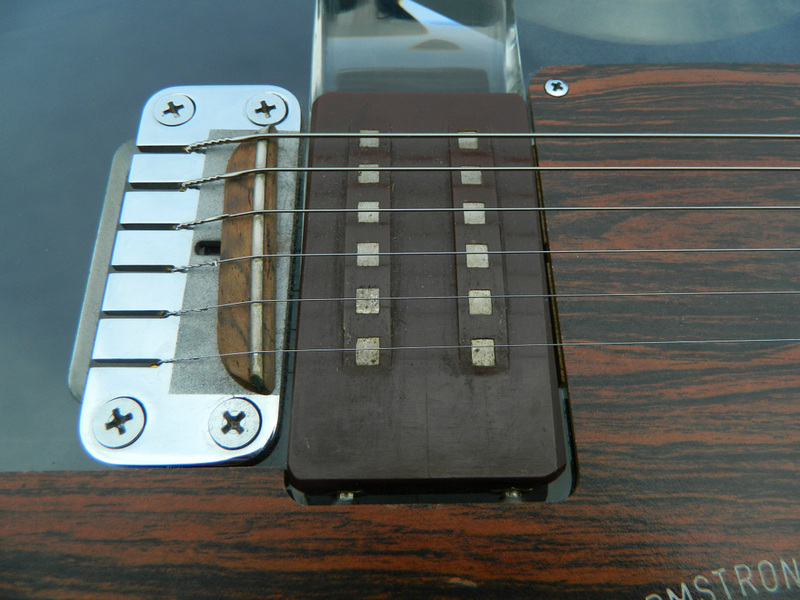 The very early guitars can also be identified by the use of slot-style machine screws to attach the bridge plate. These screws were used for approximately the first 275 guitars, because we know that all guitars up to A371D use these screws, while A379D and later instruments used phillips-head screws. 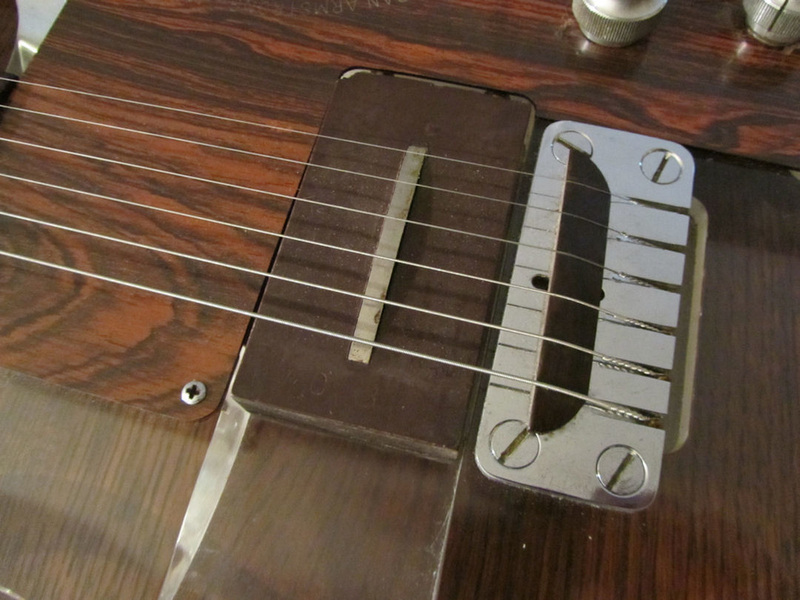 Above, 1969 Dan Armstrongs with slot-style bridge plate screws. 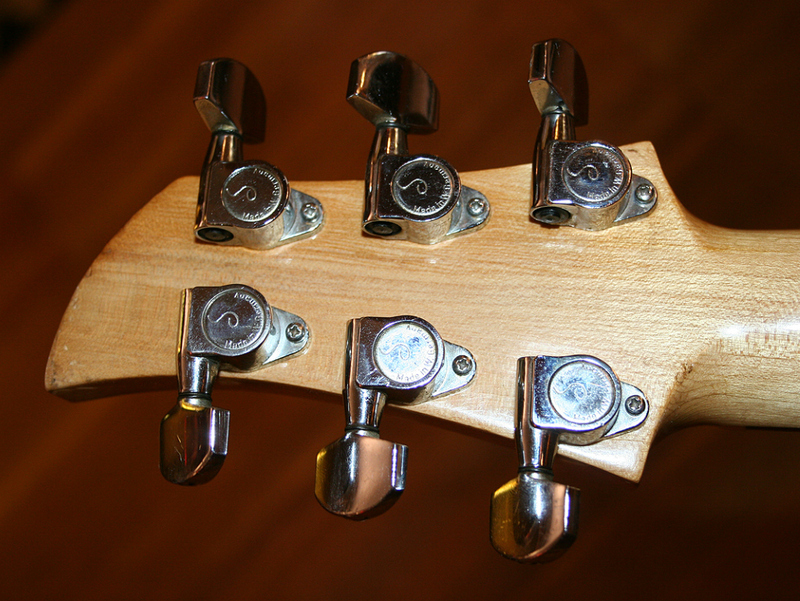 Schaller Tuner Screws. 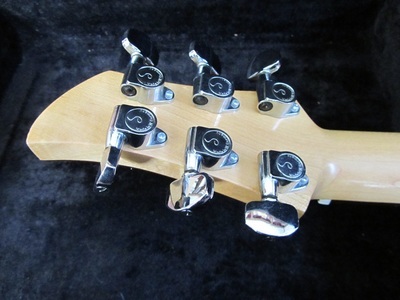 Schaller tuners were standard on all guitars throughout 1969 and most of 1970, but the very early '69's used slot-head screws to attach the tuners. This lasted for about the first 300 guitars, or up to serial number A400D, whereupon phillips-head screws were introduced. Dan Armstrong A412D is the first guitar we've documented where either Schaller or Ampeg had changed the screw format. 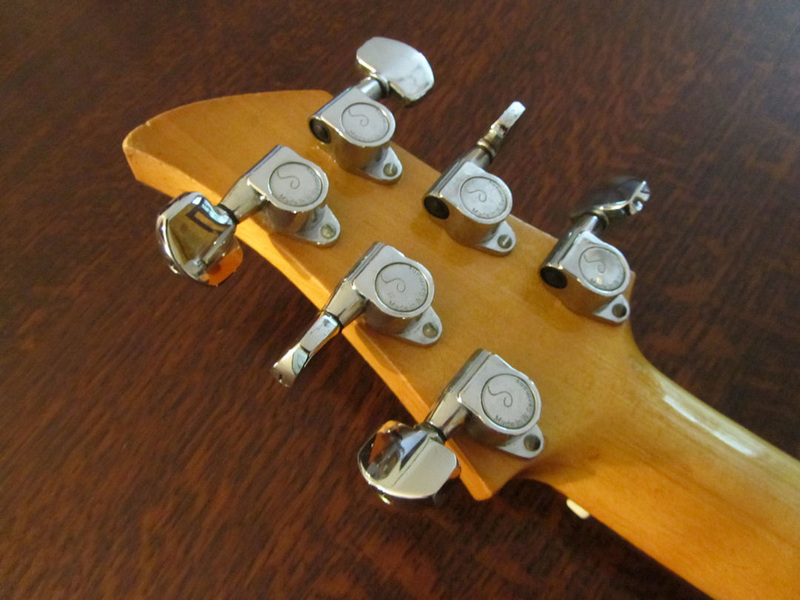 It is interesting to note that the change in tuner screws follows a similar change in bridge plate screws. 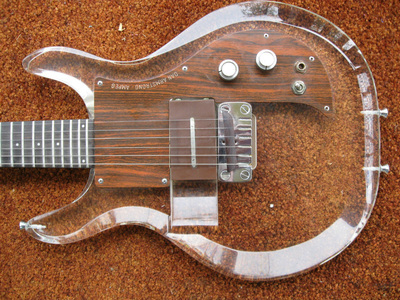 Most likely, Ampeg was trying to streamline the assembly process, and since all the other screws on the guitar were phillips-style (pickguard screws, strap button screws, truss rod cover, etc.) 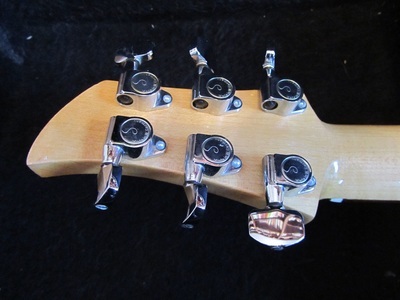 it made sense to do the same thing for the tuners. 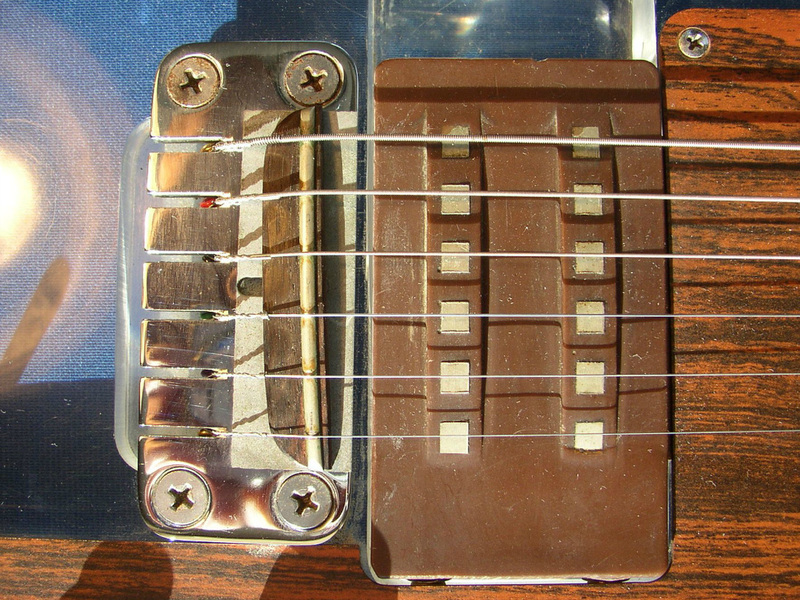 Above, 1969 guitars with slot-style tuner screws. Below, later 1969 and 1970 guitars with phillips-head tuner screws. 1971 Bridge & Saddle Update. 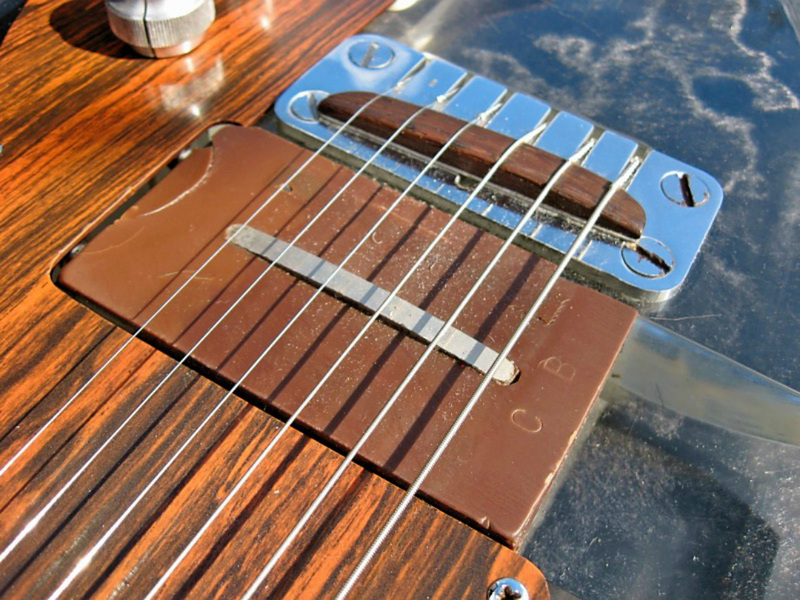 During 1971, Ampeg again modified the bridge plate to be slightly more user-friendly. This involved mechanically abrading a rectangular area under the wooden saddle, which increased friction and would have helped keep the saddle in place once intonation had been set. 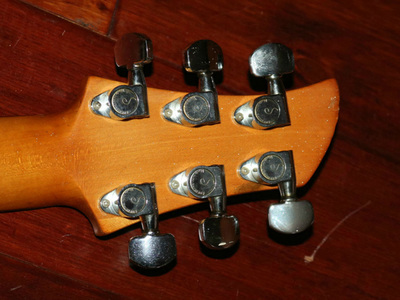 The saddle itself was also modified to incorporate a metal fret across the top, which was probably done to increase sustain as well as eliminate the tendency of strings to create grooves in rosewood. 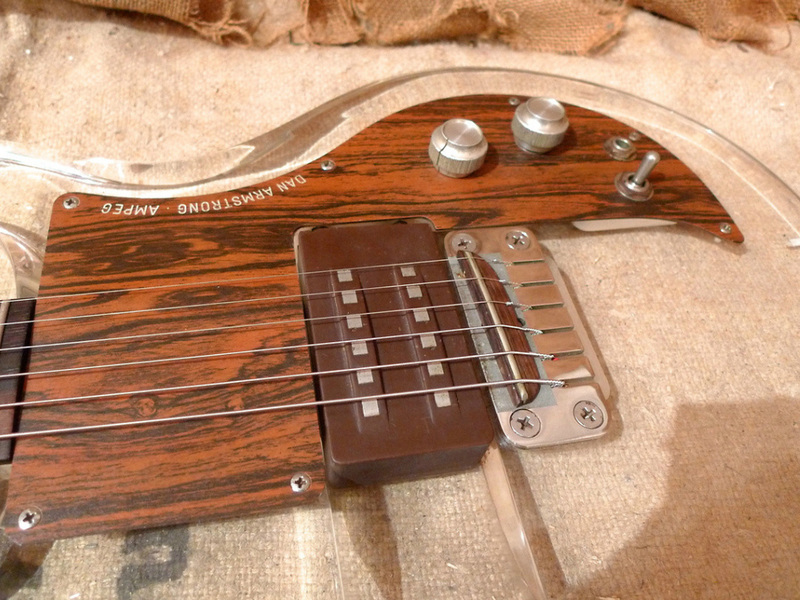 The bridge & saddle update came in with serial numbers starting with A2000D or so and continued to the end of the run. 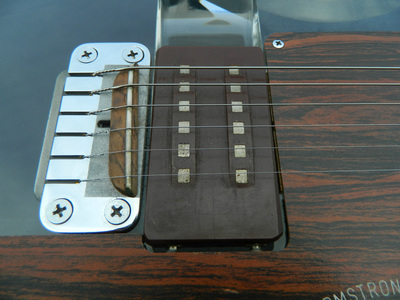 Above, updated guitar bridge introduced with serial number A2000D.